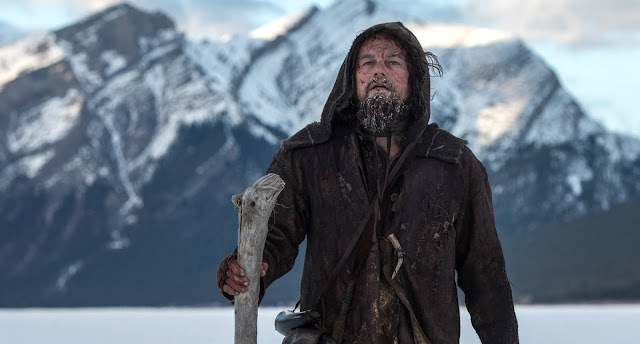 In 1823, legendary fur trapper, Hugh Glass (Leonardo DiCaprio), aids an expedition in the uncharted American wilderness. Having survived a vicious bear attack, Glass is abandoned by his hunting team and believed dead. Broken but fuelled by vengeance, he treks through the wintry, harsh terrain trailing John Fitzgerald (Tom Hardy), the former confidant who betrayed him. 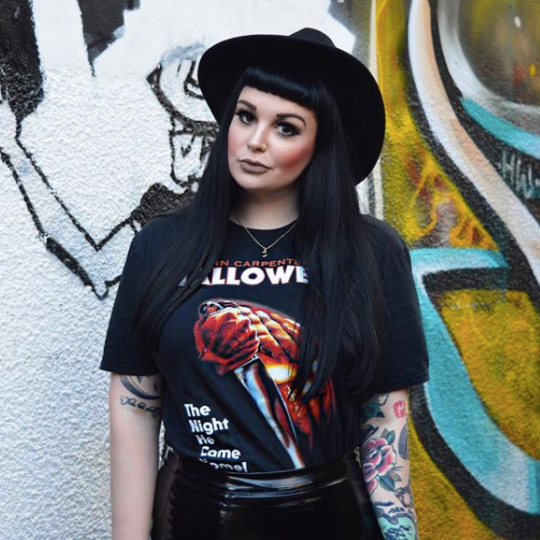 When you envisage a Western, you might think of hands on holsters, a burning sunset or perhaps a lone horseman trekking over a vast, dusty landscape. 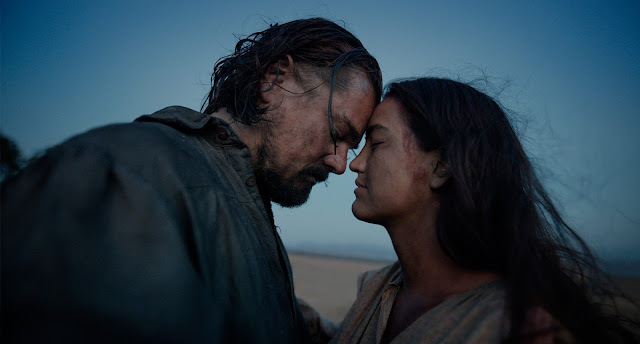 The Revenant, however, is everything but your average Western in this less commonly exploited side of the genre. Set in the snowy terrain of American wilderness in the 1800s, Alejandro González Iñárritu presents a grueling tale, based on true events, of survival and betrayal in the toughest of conditions. 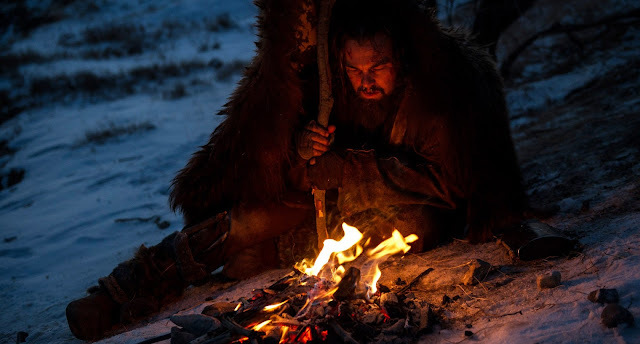 Hugh Glass, alongside his native-american son Hawk (Forrest Goodluck), are among forty men in an expedition to gather fur pelts. It's interrupted, however, when the camp is attacked my a large Pawnee tribe who are seeking the chief's kidnapped daughter. Having narrowly escaped with their lives, a smaller group of men depends on Glass to get them home but a vicious attack by a bear leaves him fighting for his life and slowing the men down. Believing him to be a goner, the crew leave Glass in the hands of his son, Hawk, Fitzgerald and Jim Bridger (Will Poulter), the youngest member of the group. Feeling held back by Glass and eager to return to camp, Fitzgerald plots a brutal plan. The Revenant is ultimately an art piece projected on the glorious silver screen for the masses. As seen with previous Iñárritu productions such as Birdman: or the Unexpected Virtue of Ignorance (2014), each shot is visually stunning and a masterpiece. Using only natural light, The Revenant captures a bitter yet beautiful landscape which totally immerses audiences in the harsh conditions of the mountains. This is aided all the further by DiCaprio's performance which is truly remarkable and possibly one of his greatest to date. Through every hardship he encounters, spectators feel every onze of pain even with the majority of his role being unspoken. Furthermore, DiCaprio acts along side some of the greatest in the next generation of Hollywood actors; an outstanding Tom Hardy as well as Will Poulter and Domnhall Gleeson who have already proven themselves to have shining careers. It is not enough for a film such as this to simply be shot beautifully, it needed the support of a truly talented cast to bring it to life and portrait its narrative in a believable and immersive fashion. 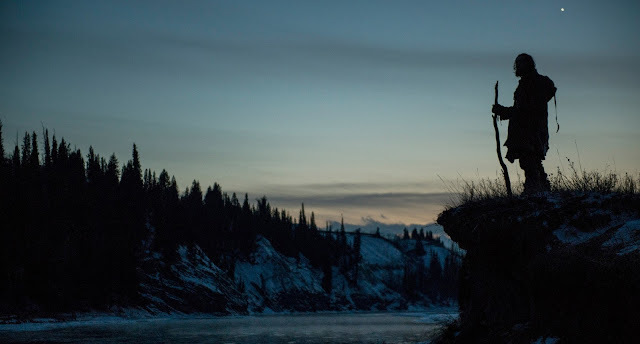 Despite an A-list lead role, The Revenant is not what you would expect from a Hollywood production nor is it for the faint hearted. With scenes of graphic violence, sexual assault and animal mutilation, the majority of it's scene are hard to swallow. As an audience member, it is clear that Iñárritu does not intend to let audiences sit comfortably but instead, he sets out to have them on the edge of their seat at all times with hearts pounding. The films ability to captivate and it's intensity is what makes it truly successful; bringing audiences an experience over a viewing. A prominent theme through out the film is life and death. Upon returning to the village, Glass states "I'm not afraid to die anymore, I've done it already". Glass essentially dies when he finds his dead son, he is left in a state of limbo; forced to brave the element despite his many wounds and faces many dangers on route. Having lost his only family, he has nothing to stay alive for other than his shear determination for revenge. He is only then reborn we he emerges from the horse's stomach he has to keep him warm. This horse acts a visual metaphor to birth Glass back in to the world and gives him the strength to get back up to find Fitzgerald. 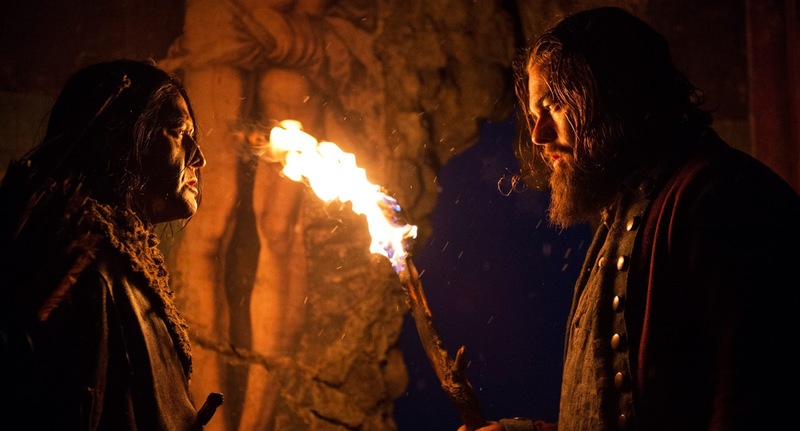 This scene and reoccurring theme is very powerful narrative tool as well as typical of the film's director, Iñárritu, who uses metaphors often to portrait deeper meanings and his characters' state of mind. Overall, having now seen the film, I find it understandable as to why it has been rewarded with twelve Oscar nominations. Shot by shot it is beautiful whilst the cast are what makes it truly believable and hard- hitting. The Revenant gets a Sophie star rating of 5 out of 5 stars and a huge salute for the Academy Awards next month. Though not entirely without its flaws, being nearly 3 hours long it did feel it could lose perhaps lose fifteen minutes or so from the running time, it is possibly a favourite of the year so far. I can't wait to see this! It looks so so good! Three hours, I will need a LOT of food when I go then because I eat it all when the adverts are on!! I've only heard great things about this film, and hearing that it has gorgeous cinematography, and was filmed only with natural light? That sounds like a film I'd find fascinating (mainly because I love natural light). I saw this and I really hope Di Caprio gets an Oscar for this! Yes, it's an excellent film and provides a stark contrast with Tarantino's Hateful Eight which does a wonderful homage to Sam Peckinpah with slow-mo kills. Inarritu's film reminds me of Sidney Pollack's 1972 film, Jeremiah Johnson, where the Robert Redford character has to contend with nature as well as humanity and has friends and enemies among the native population. 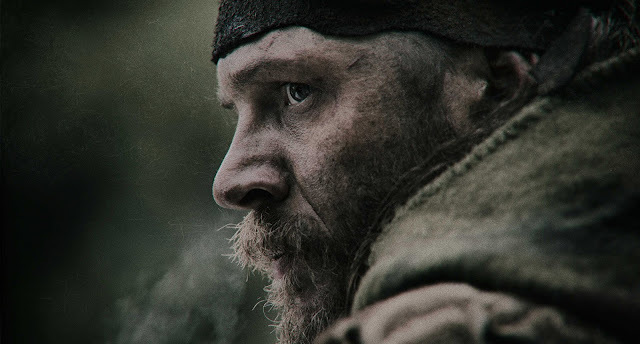 I'm glad for Leo's nom as well as Tom Hardy's (although I had a hard time understanding his American accent). I think they're similar in the setting but I do think they are completely different films with completely different subject matters and tone of voice. Jeremiah Johnson has some similarities with the Indians but again, I think its very different and just has a similar setting. Yeah I think everyone's rooting for DiCaprio and Hardy, they were truly great :) Oh really? Why couldn't you understand him? For the most part, I understood him. It's just that I realized early onward in the film, I needed to pay careful attention just as when Tom played Ronnie Kray (I had no problems understanding when he was playing Reginald Kray). In this movie, I enjoyed his dialogue about God and squirrels with the Will Poulter character :) Jeremiah Johnson is one of my favorite films so I like to mention it. Yes, as you say, there are many differences between the two films but they are both worth watching. I watched this the other day and completely agree with all your points! I love your writing style in this. I think it was such a stunning film and although it didn't have the thickest of plots, I do think that visually it was outstanding and actual dialogue wasn't necessary when it comes to Leo's acting because it was truly amazing. I don't think it felt as long as it is watching it because you just get wrapped up in the struggle and the hardship that he has to face. Although this isn't something I'm usually into, I can truly appreciate the art of it and found myself enjoying it immensely. Awesome writing! I really hope he gets an Oscar!!! Looks like a beautifully shot film although the subject matter may be a little heavy for me (I’m reaching for the feel-good movies at the mo to beat the January Blues). I’m intrigued about the themes though so perhaps one to catch when it’s on DVD. By The Sea is another dark artsy film you may want to catch. Film critics are loving Carol, although I was a little underwhelmed. You're going to hate me, but I didn't enjoy this movie! I thought it was very much style over substance. It's beautifully shot, but the story felt pretty weak to me. I think Tom Hardy's performance was more memorable. Leo deserves an Oscar, but I don't think it should be for this movie!